I first witnessed Lost Maples State Natural Area in its full fall glory some 30 years ago. A childhood on the Texas coast and early adulthood in the Hill Country left me well acquainted with the natural beauty of Texas—wide vistas in winter, riots of spring wildflowers, summer’s golden beaches. Yet, this surprised me. Seems my home state really does have it all, including autumn color, providing you know where to look. After my initial discovery, I returned often to bask in this leafy phenomenon, my three now-grown children in tow. Fall foliage pictures became a family tradition, the flip side of those mandatory spring bluebonnet snapshots. Fall color takes the right kind of trees, meaning deciduous hardwoods. These types of trees practice a sort of winter hibernation, turning off production of chlorophylls, a green pigment in the leaves responsible for producing energy for the tree. Without that green, other leaf pigments become visible, including yellow xanthophyll and orange carotenoids, or the leaf turns shades of brown. Some of the best color comes from Texas red oaks and other oaks, flameleaf sumac, cedar elm, cottonwoods, walnut, sycamore, and, of course, maples—all trees found only in certain parts of the state, at least in any significant numbers. If trees serve as fall’s canvas, rain and temperature wield the paintbrush, with cool nights and moist soil producing the most intense palette. While we can’t predict the weather, we know Texas, and these four areas offer the right combination of trees and other plants to put on a vibrant autumn show, providing the weather cooperates. If it doesn’t, you’ll still enjoy beautiful scenery along with tasty food, fun diversions, and a good night’s sleep. And plenty of Instagram-worthy photos. Lost Maples takes its name from several large, isolated stands of Uvalde bigtooth maples sheltered by rugged canyons from the warming temperatures that followed the last ice age. The mile-long Maple Trail passes through a large thicket of said trees along the banks of the Sabinal, plus the park has more than 10 miles of trails as well as backcountry campgrounds. Walnut, sycamore, and red and lacy oaks add to the park’s color palette. Walnuts and sycamores generally turn in early October, maples in early November, and oaks in late November or early December. The park posts a foliage report on the website, updated weekly October through November. Canyons also get the credit for fall color at Garner State Park, capturing cooling moisture for trees such as Texas redbud, bald cypress, western ashe juniper, pecan, and Spanish and lacey oaks. Oaks on north-facing slopes in the middle of the park generally sport the best color, while the Frio’s green waters reflect the deep bronze of cypress trees lining its banks. The peak usually occurs around Thanksgiving. Where to Eat: Mac & Ernie’s Roadside Eatery, at the corner of FM 470 and 462 in Tarpley, only opens Friday to Sunday. The nondescript green building looks like a traditional roadside café, but the menu does not; choose from items like New Zealand red deer burger (at lunch), lamb chops with fig and olive tapenade, and ancho chili honey basted quail (dinner only). Lost Maples Cafe in the town of Utopia serves a full selection of Mexican food, burgers, and steaks. 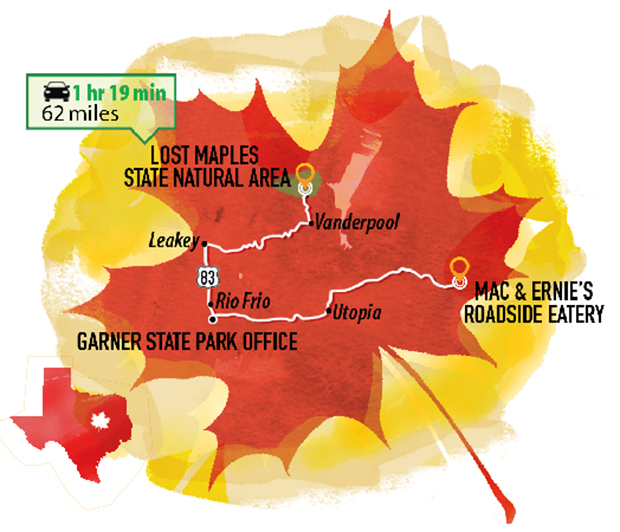 Where to stay: Camp at either Garner or Lost Maples to experience fall color in the magic of evening light. Or rent a cabin inside Garner State Park or at family-owned FoxFire Cabins near Lost Maples. Pines dominate these East Texas national forests, but pockets of hardwoods create dramatic fall foliage. Consider it a treasure hunt finding them. Ernie Murray, public affairs officer for the National Forests and Grasslands in Texas, suggests using the courthouse square in Hemphill as a starting point for viewing fall color before venturing into the surrounding Sabine National Forest. Indian Mounds Wilderness, a 12,369-acre designated wilderness area within the Sabine, also has small stands of hardwoods. Indian Mounds allows hunting, horseback riding, hiking, and camping. Where to eat: Auntie Pasta’s in Nacogdoches occupies a historic building that was the first refrigerated warehouse west of the Mississippi. Options include gourmet pizzas and a wide selection of pasta dishes, all made from scratch. Where to stay: Choose rooms in the main lodge or cabins at Pine Creek Country Inn, sprawling over pine-covered hills and around a trickling creek. This 135-square-mile park holds more than 1,000 species of plants, a variety influenced by the intersection of the Rocky Mountains, Great Plains, and Chihuahuan Desert and elevations varying from 3,600 to 8,751 feet. 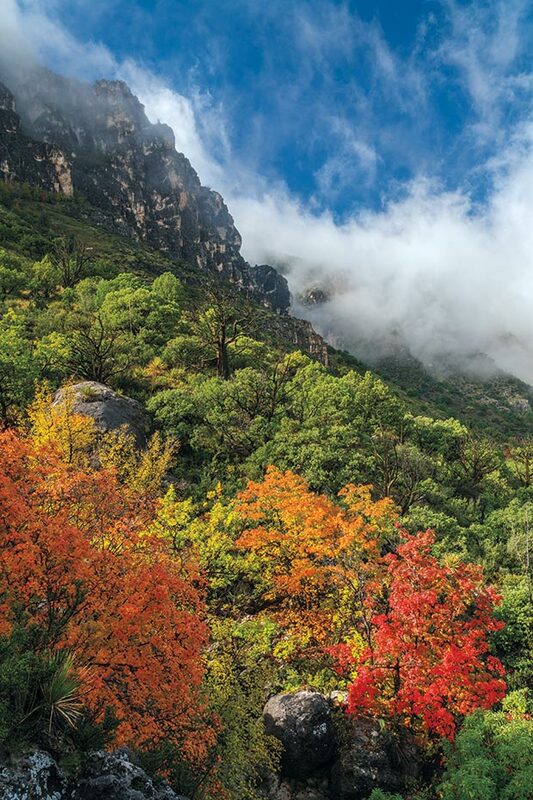 Once again, fall aficionados have a canyon to thank—McKittrick Canyon shelters stands of bigtooth maple, Texas madrones, walnut, ash, and grey and chinquapin oaks, plus desert sumac shrubs, for blasts of bright red, yellow, and orange. 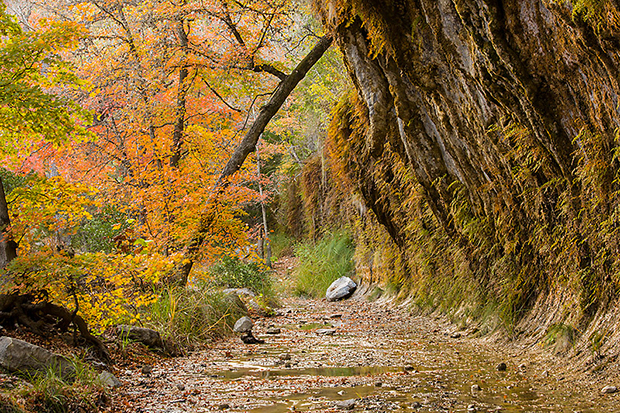 The best color lies about 2.5 miles down the canyon trail, with maples abundant from there on to the Grotto picnic area. Visitors who make the strenuous climb up McKittrick Ridge enjoy views looking down on amazing color in the canyon below. Peak occurs here around late October or early November. Where to Eat: In Van Horn, Hotel El Capitan’s dining room is best known for its signature dish, pistachio fried steak, an 8-ounce sirloin in pistachio breading. 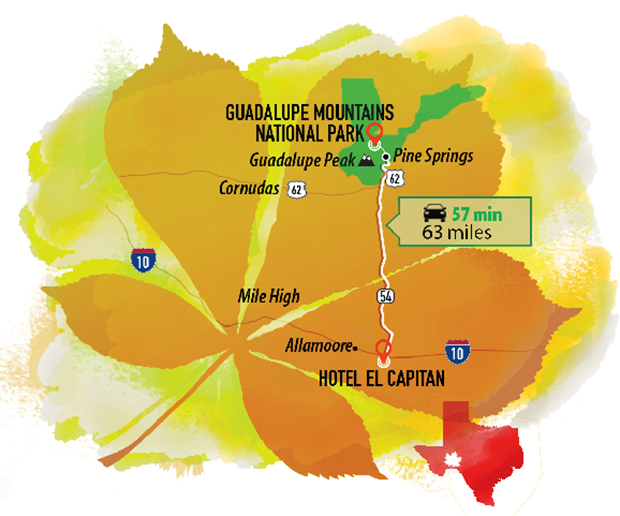 Where to Stay: Guadalupe Mountains National Park’s Pine Springs Visitor Center, on US 62/180 about 7 miles south of the McKittrick Canyon entrance, has tent and RV camping. Go for cushier digs at the Henry Trost-designed Hotel El Capitan in Van Horn, which features a central courtyard fountain and elegant old tilework. 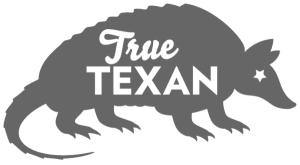 Winnsboro’s Autumn Trails celebration hosts a variety of events on weekends in October, including a chili cook-off and trail rides. Follow the Antique Car Parade route (whether your car qualifies as an antique or not) from downtown northwest on State Highway 11 to see good fall color. Daingerfield Fall Fest in Daingerfield, Oct. 12-14, features cook-offs, a street dance, carnival, parade, and 5-K run. In nearby Daingerfield State Park, sweetgum, oaks, hickory, and red maple line a lake created by the CCC, and fall color is easily enjoyed from a 2.5-mile nature trail. The park rents pedal boats and canoes for checking out the trees from the water. The waterfront Bass Lodge, also built by the CCC, sleeps 20, or visitors can snag a campsite or cabin. Locals recommend checking out fall color around the many lakes. Lake O’ The Pines offers camping and hiking among several dozen species of oaks and Florida and red maple, black gum, hickory, and many other types of trees. At Lake Bob Sandlin State Park, oak, hickory, dogwood, redbud, and maple produce spectacular fall hues. Maple, sweetgum, oak, hickory, and cypress trees—some more than 400 years old—cover Caddo Lake State Park’s Saw Mill Pond off Big Cypress Bayou. 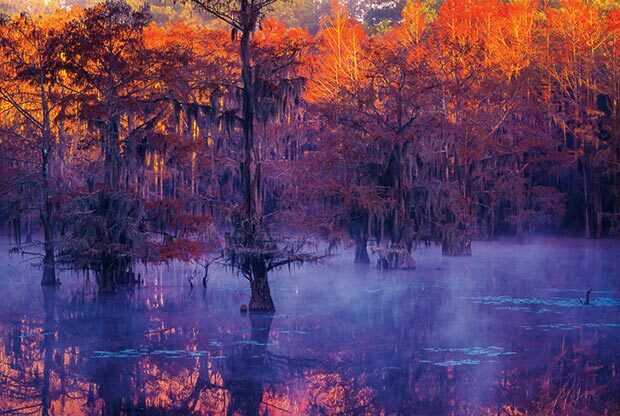 Soak up copper and bronze cypress down by the bayou, and stroll beneath colorful hardwoods on hiking trails. Color tends to peak the last week of October through late November. Where to eat: Don Juan’s Mexican Restaurant in Hughes Spring and Five D Cattle Company Steakhouse & Meat Market in Avinger both make good stopovers when traveling between these fall hot spots. 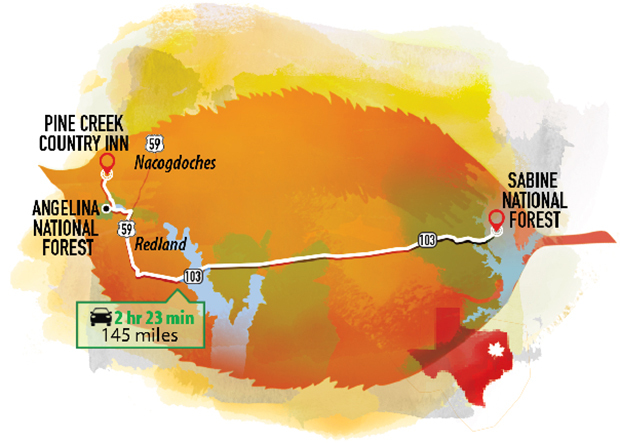 Where to Stay: Caddo Lake State Park has campsites, screened shelters, and cabins, all surrounded by its abundant trees. 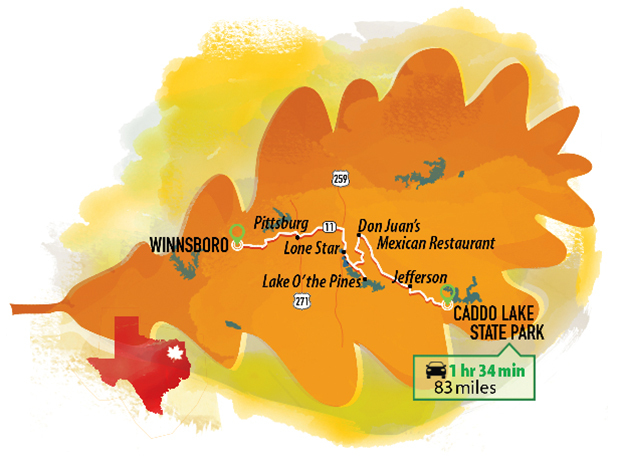 For more information, visit tpwd.texas.gov/state-parks/caddo-lake.